While slower growth in manufacturing growth tallied with our expectations, the 5% contraction in mining output threw our forecasts off course. We expect the recovery in agriculture output to cushion 1Q19 GDP growth from disappointments in mining output and weaker manufacturing expansion. The industrial production index (IPI) grew at a slower-than-expected pace of 1.7% yoy in February (+3.2% yoy in January), the weakest pace since June 2018. The fragile reading mirrored the weak export growth (-5.3% yoy in February vs. +3.1% yoy in January) as well as manufacturing PMI (47.2 in March vs. 47.6 in February), which has stayed below the 50-dividing point in the past six months. At a 5% yoy contraction in February (-0.9% yoy in January), mining production markedly undershot our forecasts. The slowdown in manufacturing output expansion (+3.7% yoy vs. +4.2% yoy in January) and electricity (+4.9% yoy vs. +7.8% yoy in January) depressed IPI growth further. The seasonally-adjusted IPI growth fell 2.0% mom in February (-1.2% mom in January), against an average of 0.5% mom increase in 2014-2018. The underperforming mining activity was dragged by the decline in natural gas production (-5.6% yoy in February vs. +0.3% yoy in January), and decline in crude petroleum output which deepened to 4.3% yoy (-2.2% yoy in January). Weak readings also spilled over to the downstream segment, which saw the production of refined petroleum products rising by only 0.2% yoy (+3.9% yoy in January). Trailing manufactured export performance, the output growth rates of export-oriented industries were generally weaker in February, such as E&E (+3.1% yoy in Feb vs. +3.9% yoy in Jan), chemicals & chemical products (+0.5% yoy vs. +2.6% yoy in Jan), and rubber & plastic products (+5.8% yoy vs. +6.3% yoy in January). Resilient food output (+6.3% yoy vs. +2.4% yoy in January) was supported by continued improvements in the output of vegetable, animal oil & fats (+17.6% yoy in February vs. +10.0% yoy in January), while the manufactures of passenger cars rose at a slower pace during the shorter working month (+8.7% yoy vs. +10.3% yoy in January). IPI growth in 2M19 (+2.5% yoy) is tracking below 4Q18’s (+3.2% yoy). Unless mining output and factory activity accelerate sharply in March, the segment’s contribution to real GDP growth could weaken in 1Q19. Nonetheless, the downside is cushioned by a recovery in the agriculture sector, particularly palm oil production. We maintain our 2019 forecasts for IPI growth (+3.7%) and GDP growth (+4.7%). 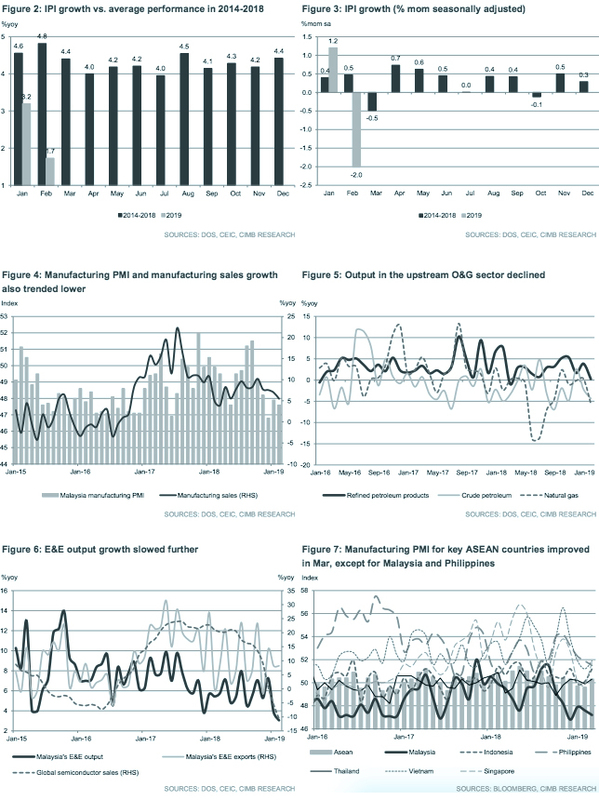 Originally published by CIMB Research and Economics on 11 April 2019. This article has been edited to reflect its time-sensitivity.